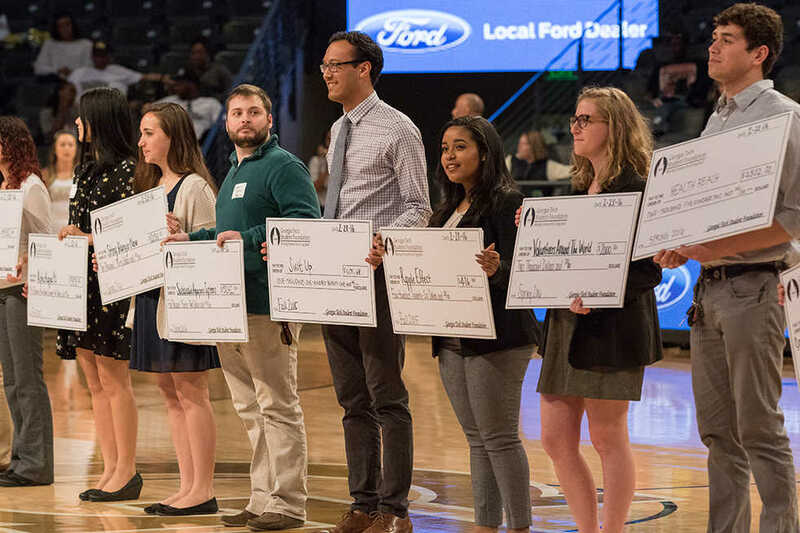 During the first time out in women’s basketball game in McCamish Pavillion on Sunday, Feb. 28, Georgia Tech Student Foundation (GTSF) representatives presented checks to a variety of on-campus student organizations to fund their ideas. Founded in 1986, GTSF has been responsible for allocating nearly $20,000 to Tech’s promising projects, initiatives and organizations every semester. Over the years, it has awarded more than $626,000 to 369 different groups. In previous years there have been up to 30 organizations that were recipients of GTSF’s allocations. Of the committees in GTSF, it is the Allocations Committee that deals with selecting the lucky recipients of the checks. The following organizations were allocated checks this Spring: Sting Hunger Now, Energy Club at Georgia Tech, GT USLI, Industrial Design Society of America, GT Health Reach, Triangle Fraternity, Transfer Student Association, Volunteers Around the World, Teach Beautification Day and Sustainable Aquaponics System. Not all of these groups could attend the basketball game to receive their checks. Sean Mihm, second-year CHBE, along with Chief Executive Officer Priya Srinivasan, fourth-year BA, Chief Financial Officer Brandon Danzig, fourth-year EE, and Chief Operating Officer Isaac Wittenstein, fourth-year ME, were at the basketball game, awarding the checks to the recipients. Fifteen representatives of organizations walked to the center of the stadium, each holding a novelty check. “We allocated this semester a total of $20,000 which was the largest amount allocated in Georgia Tech Student Foundation history,” Mihm said. There is an application process for organizations requesting funding with several criteria, including that the initiatives benefit the Tech or Atlanta community in some way. First, there is a written application with questions regarding each organization’s initiative, and its end goal. After the applications are graded, roughly 20–25 of the organizations are selected to present a pitch of a few minutes. Project ideas that show a sense of feasibility, responsibility on the students’ behalf and innovation tend to get top priority when choosing which groups to fund each semester. “As for physical items or events we will fund there really is no set criteria. For instance we funded an aquaponics system that grows plants and raises fish for food deserts in the Atlanta area as well as funding an initiative to help with profession development of freshman at Tech. Ultimately, we are looking for organizations that fit our goals to create an even better Georgia Tech,” Milm said. After receiving funding, organizations are welcome to apply again in following semesters if they have new ideas. GTSF encourages any organizations and initiatives that support its ultimate goal of “giving back” to the Tech community to do so.